“After saying this, he was taken up into a cloud while they were watching and they could no longer see him. 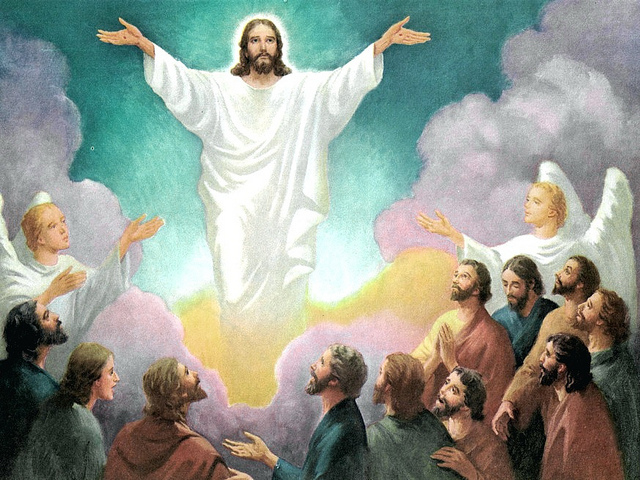 As they strained to see him rising into heaven, two white-robed men suddenly stood among them. ‘Men of Galilee,’ they said, ‘why are you standing here staring into heaven? Jesus has been taken from you into heaven, but someday he will return from heaven in the same way you saw him go!’” (Acts 1:9-11). “After saying this…” Do you remember those last words spoken by Jesus before he departed this earth and ascended to heaven, with a promise by his angels that he would return to Jerusalem in exactly the same place and manner in which he left? These are his words: “But you will receive power when the Holy Spirit comes upon you. And you will be my witnesses, telling people about me everywhere—in Jerusalem, throughout Judea, in Samaria, and to the ends of the earth.” (Acts 1:8). Messiah Jesus could have said any number of things just before he returned to heaven; but he told his disciples that they should tell people everywhere about him, beginning in Jerusalem, then Judea, then Samaria, then to the ends of the earth. The sequence commissioned by the Lord is deliberate and decisive. The Gospel of Jesus Christ was to be proclaimed first to the Jews in Jerusalem and Judea, then to the mixed race of Jews and Gentiles (Samaritans), and finally to Gentiles all over the world. “For I have a great sense of obligation to people in both the civilized world and the rest of the world, to the educated and uneducated alike. So I am eager to come to you in Rome, too, to preach the Good News. For I am not ashamed of this Good News about Christ. It is the power of God at work, saving everyone who believes—the Jew first and also the Gentile. This Good News tells us how God makes us right in his sight. This is accomplished from start to finish by faith. As the Scriptures say, ‘It is through faith that a righteous person has life’” (Romans 1:14-17, quoting Habakkuk 2:4, italics for emphasis). A short time before that, Paul condensed the Gospel of Jesus Christ in a concise but powerful presentation: “I passed on to you what was most important and what had also been passed on to me. Christ died for our sins, just as the Scriptures said. 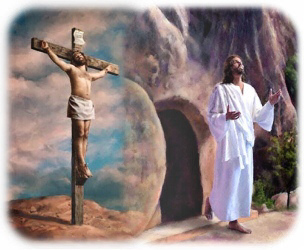 He was buried, and he was raised from the dead on the third day, just as the Scriptures said” (I Corinthians 15:3-4). Then in keeping with the most reliable record of proof for any historical event, both then and now, Paul provides documented evidence of the resurrection of Jesus Christ through eye-witness accounts: “He was seen by Peter and then by the Twelve. After that, he was seen by more than 500 of his followers at one time, most of whom are still alive, though some have died. Then he was seen by James and later by all the apostles. Last of all … I also saw him” (Verses 5-8). Can the words of Jesus and Paul be any clearer? Not only was the Good News of God’s marvelous New Covenant plan of salvation in and through Jesus Christ to be preached to the entire world, it first must be shared with the Jews. 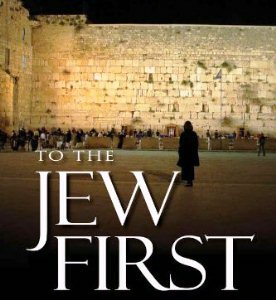 Why first, foremost, and continually to the Jews? That question will be answered, but not until we examine an astonishing decree issued by the Roman Catholic Church’s seat of authority, the Vatican, just a few weeks ago on December 10th, 2015. 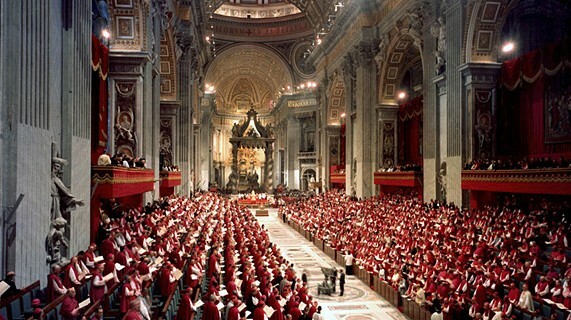 The Second Vatican Council in October, 1965 called the Nostra Aetate, was a substantial shift in the Catholic Church’s historical view that Jews were collectively guilty for the death of Jesus. That Council sought to normalize relations with Israel in particular and Jews in general, by calling for more open and friendly interaction with not only Judaism, but all religions, including Islam. In context, this last observation clearly equates the efforts to “convert” Jews to Christianity with other anti-Semitic activities including, for example, hatred for and violence toward Jews all over the world … mostly at the hands of Muslims; but also Roman Catholic animosity toward Jews, particularly in European nations. For evangelical Christians who may not be aware, there are several Jewish “anti-missionary” organizations such as Yad L’Achim and Jews for Judaism that seek to suppress Christian and Jewish Messianic groups such as Jews for Jesus from spreading the Gospel of Jesus Christ anywhere in Israel, but also the world over. Ironically, the Christian faith in the first century was also considered a “cult” by the Jews and an offshoot sect of Judaism by the Gentile Romans. But what about the tens of thousands of Israeli Jews who are (rightfully) classified as Jewish citizens of Israel, yet who are not observant Jews, i.e. those who do not actively support the orthodox or even conservative tenets of Judaism? Should their lack of following and practicing the requirements of observant Judaism disqualify them from being classified by the State of Israel as a Jew? In terms of whether they are Jewish citizens of the State of Israel, how are they any different from Jews in Israel who believe in Jesus as Messiah and Savior of Israel? Neither are observant Jews in the traditional sense of strictly espousing and practicing the Law of Moses. Getting back to the Roman Catholic decree ordering mainstream Catholics not to engage in “evangelism” to the Jews in the same fashion as trying to convert people from other religions: of course a true believer in Christ would not be anti-Semitic in any way, shape, or form. We recognize our heritage that began with God revealing himself to Abraham and the Jewish nation. We believe in a Jewish Messiah who is the light of the world promised to both Jew and Gentile alike. We believe all of God’s promises to restore the Jews, physically and spiritually, apply to Israel, not the Church; thereby, rejecting Replacement Theology. But I would propose that withholding the Good News of God’s salvation to his chosen people is the worst form of anti-Semitism. It is denying them the truth of their Scriptures, both Old and New Testament. For the New Testament is nothing more or less than a composite record of the New Covenant prophesied by the Jewish prophet, Jeremiah (See Jeremiah 31). It is account in the four Gospels and the Book of Acts of the birth, life, ministry, death, and resurrection of the long-awaited Messiah foretold by nearly all of the Old Testament prophets. It is the encapsulation of the life-changing and destiny altering truth that Jesus of Nazareth is the Way, the Truth, and the Life (of the entire world) in the New Testament Epistles. It is the final revelation of Messiah Jesus and the glorious hope of his return found in the Book of Revelation. “…By what power, or in whose name, have you done this?” (Acts 4:7). Meaning the healing of a man crippled from birth. “Then Peter, filled with the Holy Spirit, said to them. Rulers and elders of our people, are we being questioned today because we’ve done a good deed for a crippled man? Do you want to know how he was healed? Let me clearly state to all of you and to all the people of Israel that he was healed by the powerful name of Jesus Christ the Nazarene, the man you crucified but whom God raised from the dead. For Jesus is the one referred to in the Scriptures where it says, ‘The stone that you builders rejected has now become the cornerstone.’ There is salvation in no one else! God has given no other name under heaven by which we must be saved” (Acts 4:8-12, quoting Psalm 118:22). That my friend is the Good News! Jesus Saves! Not a distorted, watered-down gospel that claims keeping of sacraments and performance of good works as a pre-requisite for salvation and eternal life. In that regard, I have no problem with the Vatican ordering their clergy and laity not to “convert” Jews. For a Jew to convert to Roman Catholicism is to make them worse off than they were before such a conversion. It’s nothing more than leaving one religion of good works for another religion that claims salvation is procured through keeping of the law. Listen to the words of a former Jewish religious leader who also considered Jewish Christians as heretics, cultic, rebels, and anti-Semitic in their beliefs. This was a man who was far more militant than today’s Yad L’Achim representatives; a man who imprisoned and physically persecuted Jewish believers in Jesus. That is, until he had a miraculous encounter with the risen Messiah that changed the course of his entire life and eternal destiny. As it was in Paul’s day (the first century) when he began preaching the New Covenant, the New Way of getting right with God, so it still is today in our world. The orthodox Jews are still trying to merit God’s favor by keeping the law, which no one has ever done or ever will do, completely. “With Christ as my witness, I speak with utter truthfulness. My conscience and the Holy Spirit confirm it. My heart is filled with bitter sorrow and unending grief for my people, my Jewish brothers and sisters. I would be willing to be forever cursed—cut off from Christ!—if that would save them. They are the people of Israel, chosen to be God’s adopted children. God revealed his glory to them. He made covenants with them and gave them his law. He gave them the privilege of worshipping him and receiving his wonderful promises. Abraham, Isaac, and Jacob are their ancestors, and Christ himself was an Israelite as far as his human nature is concerned. And he is God, the one who rules over everything and is worthy of eternal praise! Amen” (Romans 9:1-5). Paul then presents compelling evidence as to who is truly a Jew and who is not. In doing so, he demonstrates that when a Jew believes in Jesus and accepts him as personal Savior, he or she is not converting from Judaism to Christianity. It’s not a matter of conversion from one religion to another … not even close. In fact, nowhere does Paul or any other author of the New Testament consider Christianity to be a religion whatsoever. A religion is man’s attempt to appease God or gain God’s favor by keeping a set of laws or rules or rituals. The Christian faith is simply trusting what Christ did on the cross for complete pardon of our sins and promise of eternal life with God in heaven. “Well then, has God failed to fulfill his promise to Israel? No, for not all who are born into the nation of Israel are truly members of God’s people! Being descendants of Abraham doesn’t make them truly Abraham’s children. For the Scriptures say, ‘Isaac is the son through whom your descendants will be counted,’ though Abraham had other children, too. This means that Abraham’s physical descendants are not necessarily children of God. Only the children of the promise are considered to be Abraham’s children” (Romans 9:6-8, quoting Genesis 21:12). Paul explains in his letter to the Galatians that the real children of promise are those that acknowledge Jesus as the Jewish Savior; because it was Christ Jesus who became the true Child of Promise … the Anointed Messiah. That is the message of the Good News of the Gospel. “…And that message is the very message about faith that we preach: If you confess with your mouth that Jesus is Lord and believe in your heart that God raised him from the dead, you will be saved. For it is by believing in your heart that you are made right with God, and it is by confessing with your mouth that you are saved … Jew and Gentile are the same in this respect. They have the same Lord, who gives generously to all who call on him. For, ‘Everyone who calls on the name of the Lord will be saved’” (Romans 10:8-13, quoting Joel 2:32). Do we keep silent so as not to offend Orthodox Jews who have for hundreds of years beginning in the first century done everything possible to prevent the Gospel from being promulgated to “the Jew first.” Do we actually think telling someone that Jesus is the Jewish Messiah and that he is the Way, Truth, and Life is tantamount to anti-Semitism? When, in fact, it’s our love and concern for every Jew to experience the life-giving light of the New Covenant promised and prophesied by Jeremiah to God’s people. Do we make an exception for the Jews because they were the people through whom God revealed himself to the nations? No, it’s because they ARE the chosen people that we are compelled to share the Good News of God’s redemption. A redemption found only in one Person: The Son of God, Son of David, and Son of Man … Jesus of Nazareth. “But how can they call on him to save them unless they believe in him? And how can they believe in him if they have never heard about him? And how can they hear about him unless someone tells them? And how will anyone go and tell them without being sent? That is why the Scriptures say, ‘How beautiful are the feet of the messengers who bring good news!’ But not everyone welcomes the Good News, for Isaiah the prophet said, ‘Lord, who has believed our message?’ So faith comes from hearing, that is, hearing the Good News about Christ” (Romans 10:14-17, quoting Nahum 1:15 and Isaiah 53:1). That is the gospel we love and share with all who will listen, to the Jew first and then to the Gentile. That is the Good News that will change a person’s heart and alter their destiny forever. It is literally a matter of eternal life and death. I Agree … Don’t Try to Convert Jews to Roman Catholicism! My first reaction was the same as so many other Christians when I heard of the Vatican’s decree, i.e. what convoluted twisted logic! But the more I thought about it, the more I’m certain that it was a good decision by the Vatican. Actually, there really would be no conversion in the first place, as both Judaism and Catholicism espouse some of the same dogmas. For example: The Roman Catholic Priesthood is basically a derivative of the priestly order of Judaism, even though the Levitical animal sacrificial system is no longer practiced by the Jews, as there is no longer a Mercy Seat, or a curtain separating the Holy Place from the Holy of Holies. In fact, there is no longer a Temple at all! “The intriguing question posed in this article and the past two Eye of Prophecy articles relating to the fate of the Jewish Temples is designed as a challenge to explain what happened to them and why. To stimulate reflection about the repercussions of such a devastating time of Jewish history. To investigate the staggering impact on the entire Jewish faith WHEN Solomon’s Temple, then (hundreds of years later) Herod’s Temple, was destroyed. But also Gentile participation in this history pertaining mostly to religious systems that, to varying degrees, were patterned after and around the Mosaic Laws. In place of the daily, monthly, and annual sacrifices, Jews today rely heavily on Yom Kippur, the Day of Atonement, as a means of forgiveness of sins against God once a year. The Roman Catholics seek forgiveness of sins through periodic confession with their priest, whom they call, “Father” (contrary to the very words of Jesus who said, “Call no man, Father”). Then the penitent parishioner is given such absurd duties in order to be forgiven as to repeat “Hail Mary” five times. The greater the offense, the more Hail Marys’ must be said. The Apostle Peter, himself, (who the Catholics claim was the first Pope) tells us that every born-again believer in Jesus is a priest. Not only priests, but “living stones” that have replaced the Temple that once stood in Jerusalem. Because the Kingdom of Heaven currently on earth is found in the hearts of those who believe in Jesus Christ, the cornerstone of the true church of God (I Peter 2:6). Nor do we need an earthly priest (priests) as a mediator between God and ourselves. “For there is only one God and one Mediator who can reconcile God and humanity—the man Christ Jesus. He gave his life to purchase freedom for everyone. This is the message God gave to the world at just the right time” (I Timothy 2:5-6). Jesus Christ did away with the priestly system of atonement, because he is the High Priest for all people, Jew and Gentile alike. And, “But now Jesus, our High Priest, has been given a ministry that is far superior to the old priesthood, for he is the one who mediates for us a far better covenant with God, based on better promises. If the first covenant had been faultless, there would have been no need for a second covenant to replace it. But when God found fault with the people, he said: ‘The day is coming, says the Lord, when I will make a new covenant with the people of Israel and Judah. This covenant will not be like the one I made with their ancestors when I took them by the hand and led them out of the land of Egypt. They did not remain faithful to my covenant, and I turned my back on them, says the Lord. But this is the new covenant I will make with the people of Israel on that day, says the Lord: I will put my laws in their minds, and I will write them on their hearts. I will be their God, and they will be my people” (Hebrews 8:6-10, quoting Jeremiah 31:31-34). And, “When God speaks of a ‘new’ covenant, it means he has made the first one obsolete. It is now out of date and will soon disappear” (Hebrews 8:13). 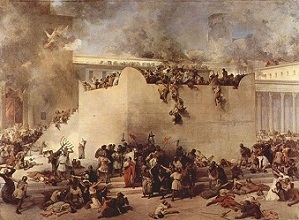 The Jewish author of the book of Hebrews knew that the New Covenant had already replaced the Old Covenant; it would just be a matter of time before the Levitical sacrificial system would be “obsolete.” A few years later that is exactly what happened when the Romans ruthlessly sacked Jerusalem and demolished the Temple in 70 AD. The Law of Moses could never save anyone, not because the Law was inadequate. But because no human being could keep that Law. So I humbly and earnestly ask the observant Jew and the practicing Roman Catholic: Why are you trying to hang onto to a system of good works and rabbinical or priestly mediation when, in fact, God’s New Covenant has been available to you since the first century? You don’t need to consult with or seek mediation through Rabbis, who (as much as I respect their devotion to God) offer conflicting advice that often contradicts their own Scriptures. You don’t need absolution through a priest or the repeated shedding of Jesus blood through the sacrament of Mass. In fact, that is an insult to God and to Christ, mocking his once and for all sacrifice for your sins. You don’t need to ask Mary to intercede for you; there is one and only one Mediator, the man Christ Jesus who just happens to also be the Son of God. Only Jesus, who perfectly, without sin, fulfilled the entire Law of Moses was qualified to make atonement for our sins. It was the death of the just for the unjust, the righteous for the unrighteous, the perfect for the imperfect. Biblical salvation is truly a free gift from God that, under no circumstances or conditions, can be earned by any number of good deeds or the keeping of regulations and rituals. A born again believer in Messiah Jesus recognizes that good deeds are a grateful response to what Christ did for us—a result of our salvation … not the means of salvation. True children of God and of Abraham (through Isaac) understand that God has imputed his righteousness to us through the finished work of Jesus on the Cross. His righteousness is our righteousness. We have none of our own. Although the Vatican’s reasoning behind their decree is faulty, I nevertheless applaud their decision. Stop trying to convert Jews to a system that distorts the New Covenant of Grace freely offered through the once and for all saving sacrifice of Jesus atoning death on the Cross. There is a far better way through what Jesus accomplished by offering the greatest price ever paid (his very blood and life) to achieve the greatest salvation known to man … a complete pardon of our sins and a total assurance of everlasting life in heaven. As in Paul’s time, to this very day, “So this is the situation: Most of the people of Israel have not found the favor of God they are looking for so earnestly. A few have—the ones God has chosen—but the hearts of the rest were hardened. As the Scriptures say, ‘God has put them into a deep sleep. To this day he has shut their eyes so they do not see, and closed their ears so they do not hear’” (Romans 11:7-8, quoting Isaiah 29:10). “Did God’s people stumble and fall beyond recovery? Of course not! 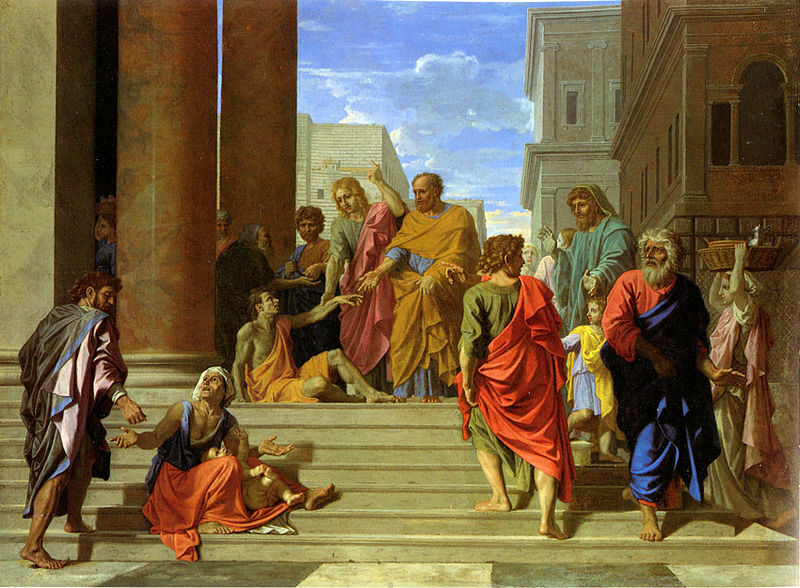 They were disobedient, so God made salvation available to the Gentiles. But he wanted his own people to become jealous and claim it for themselves. Now if the Gentiles were enriched because the people of Israel turned down God’s offer of salvation, think how much greater a blessing the world will share when they finally accept it … For since their rejection meant that God offered salvation to the rest of the world, their acceptance will be even more wonderful. It will be life for those who were dead! (Romans 11:11-15). To all Jews, both observant and non-observant, please consider this: Since the God of Israel announced the New Covenant through your prophet, Jeremiah, why have there been no kings in Israel? Why have there been no priests and prophets in Israel less than a generation after Jesus Christ proclaimed during the Passover supper? : “…This cup is the new covenant between God and his people—an agreement confirmed with my blood, which is poured out as sacrifice for you” (Luke 22:20). Could it be that your final, once for all Prophet and High Priest has come to you? That the New Covenant has been given to you? Could it be that the King of kings will soon return to rule and reign from Israel? As a nation, you have been reborn from the floods of dispersion and the fires of Nazi death camps. Now as individual Jews, don’t wait until it’s too late, when you will look on the Messiah and mourn for him whom you pierced (Zechariah 12:10). Stop working so hard to earn God’s favor. You can’t do it, no one can. Listen to the words of Messiah Jesus: “…This is the only work God wants from you; Believe in the one (Jesus) he has sent” (John 6:29). Your Messiah beckons you to heed his words to Nicodemus, a Jewish Member of the Sanhedrin who came secretly to Jesus looking for answers, “I tell you the truth, unless you are born again, you cannot see the Kingdom of God” (John 3:3). He implores you to say, “Yes,” to him as your Redeemer and Messiah. “Jesus replied, ‘I am the bread of life. Whoever comes to me will never be hungry again. Whoever believes in me will never be thirsty’” (John 6:35). Listen to his invitation: “Look! I stand at the door and knock. 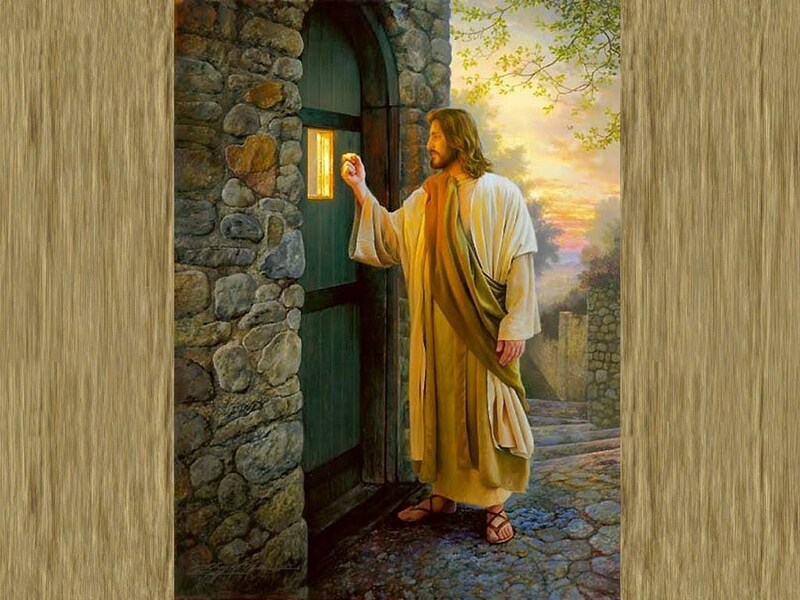 If you hear my voice and open the door, I will come in, and we will share a meal together as friends” (Revelation 3:20). “Since we believe human testimony, surely we can believe the greater testimony that comes from God. And God has testified about his Son. All who believe in the Son of God know in their hearts that this testimony is true. Those who don’t believe this are actually calling God a liar because they don’t believe what God has testified about his Son. And this is what God has testified: He has given us eternal life, and this life is in his Son. Whoever has the Son has life; whoever does not have God’s Son does not have life. I have written this to you who believe in the name of the Son of God, so that you may know you have eternal life” (I John 5:9-13, italics for emphasis).